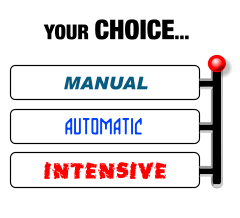 Any agreement for but not limited to ‘tuition / training / coaching / assessments’ (the lesson) is solely between you and your instructor. Any matter relating to the time, duration ‘pick up’ and ‘drop off’ locations must be arranged between you and your instructor. 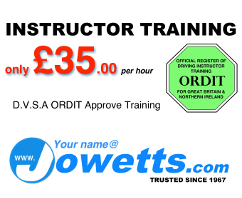 Your initial lesson booked via Jowetts call centre will have already been mutually arranged. If any of your circumstances change that affect any of your lessons, then you must inform Jowetts call centre staff and your instructor immediately. If you fail to notify us and your lesson cannot commence then you may be charged the full lesson fee. Jowetts act as an agent for your instructor for any booking made via its call centre and in receiving payment for your lessons but excludes any payments you make directly to your instructor. Monies for pre-paid lessons / lessons in advance must be paid directly to our call centre by Credit/Debit card or by Cheque made payable to 'Jowetts' via your instructor which must be accompanied by a valid ‘Cheque Guarantee Card’. Please telephone 0191 4134413 for further details and how to pay. Do not send cash in the post. We accept all Major Credit/Debit cards. 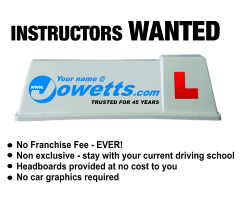 You can pay cash to your Jowett’s Driving Instructor if you are paying for your lessons as you go. We accept no liability for cash payments for pre-paid lessons / lessons in advance which you pay directly to your Instructor. Please obtain a receipt for any payments you make to your instructor. This must be completed by using an authorised Jowetts ‘appointment / accounts card’. Please ensure your instructor completes this card at each lesson. Please keep it safe and in your possession. In the unlikely event of a dispute we regret we cannot discuss any matter without it. You must telephone us if you do not have one or if it has been lost, misplaced or stolen. This card is only valid with an authorised signature by a member of our office staff. Only our call centre can issue these. When you receive the ‘appointment / accounts card’ or its replacement please check that the information on it is accurate. Contact our call centre immediately if any information is not accurate. Over the last 45 years we have had very few complaints. The most common is that the instructor is running late usually because they have been held up in traffic. If you have a complaint first try and sort it out with your instructor. If you don’t want to do this and just want to move to another instructor within Jowetts then that is fine. If you feel you want to take matters further we will support you but you will need to write to us with details and if the complaint is about financial arrangements then you will need your completed accounts / appointment card plus any other supporting evidence. If your complaint is serious we will require you to make a statement to the police or to someone in Authority. Only one special offer or lessons on sale is available per pupil. They cannot be used in conjunction with any other offer and you cannot use them for the DVSA’s Practical test or for the lesson before the test. This applies to Special offer or lessons for sale purchased including on a Gift Voucher regardless who purchased the lessons. Special offer lessons, special offer gift vouchers or lessons on sale are subject to availability. Due to heavy demand we cannot guarantee female instructors. These lessons are not available to customers who have had any previous driving experience. If you have purchased a special offer, special offer gift voucher or any lesson on sale and you have had previous experience then full lesson price will apply. Please contact us for further details. Discounts are always available on ‘Block Bookings’ such as 10 manual lessons for £180. 48 hours notice is required when cancelling or changing appointments, otherwise the full standard lesson fee will be charged. (You will be charged the full standard lesson fee even if your lesson was at a Special or discounted rate). The full lesson fee will also be charged for appointments not kept. All Gift Vouchers and Special offer lessons expire 6 months from purchase. All other pre-paid lessons / lessons in advance expire 12 months from purchase. All prices are subject to change but we will honour any pre-paid lessons or lessons purchased in advance. You can apply for a refund for any pre-paid lessons / lessons in advance up to 12 months after the date of purchase (Gift Vouchers and Special offer Lessons are Non-Refundable and Non-Transferable from the date of purchase. Lessons scheduled to take place within the next 48 hours are not refundable or transferable). Any lessons already taken will be charged at the full standard rate and a £10 cancellation fee will apply. Refunds must be requested in writing to Jowetts Driving School accompanied with your Jowetts ‘appointment / accounts card’, before this period has passed. You cannot sell or transfer lessons which you have bought or which have been bought for you without the consent of Jowetts. Other terms and conditions may apply to Gift Vouchers and Special offer lessons. Please contact our call centre for further details.